Owned by the renowned oenologist Vittorio Fiore, Castelluccio was originally founded in the 1970s. In the 1980s Vittorio Fiore became the consulting winemaker and in 1999 he purchased the majority of shares in the property. Castelluccio is nestled in the Modigliana Hills, between the two towns of Faenza and Forlì, at an altitude range of 750 - 1500 feet above sea level. The territory is known as Emilia Romagna and was part of Tuscany until the 1930s. 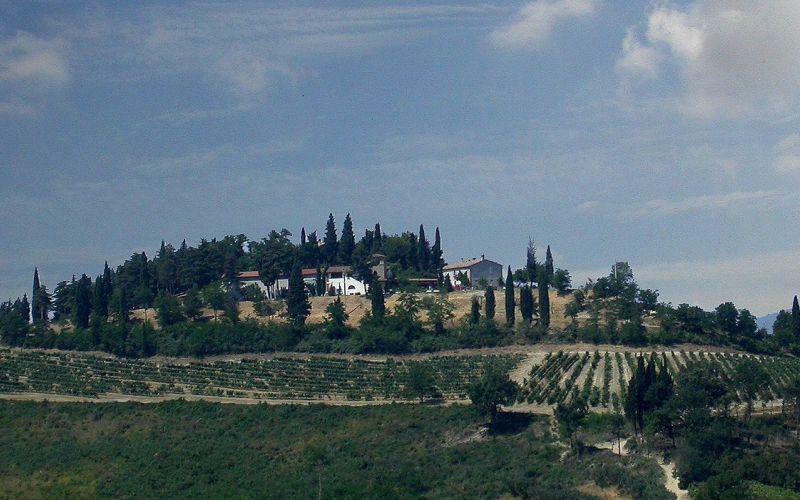 Castelluccio extends approximately 150 acres, with 36 acres of vineyards and 6 acres with olive trees. The soil is compact layered marl and limestone, the location is composed of micro-areas called "ronchi", referring to the rock formations that protrude from the mountain side, and render a very high quality of grapes. Sangiovese di Romagna, Cabernet Sauvignon and Sauvignon Blanc are the main grape varieties grown at Castelluccio. Sangiovese di Romagna is indigenous and expresses perfectly the character of the terroir and is a central grape to some of the world's greatest wines. Color: intense ruby red, with light purple tones when young. Bouquet: clean and clearly defined, with soft raspberry and other berries scent. Taste: sapid, lively and well balanced; a long-lasting and fruity taste that well matches the bouquet, reminding of fruits of the forest and berries.